Pre-Writing Tracing Shapes: In this packet you will find all you need to prep your students for writing readiness with pre-writing skills. Pre-writing skills are the basic skills needed to develop the necessary handwriting strokes to master letter formation while targeting fine motor skills to improve pencil grasp. Pre-writing shapes are the core of pre-writing skills. These shapes are the strokes that make up most letters, numbers and drawings. Included in this program are the 9 basic developmental pre-writing shapes: horizontal line, vertical line, circle, cross, square, diagonal line /, diagonal line \ , "X“ symbol, and triangle. 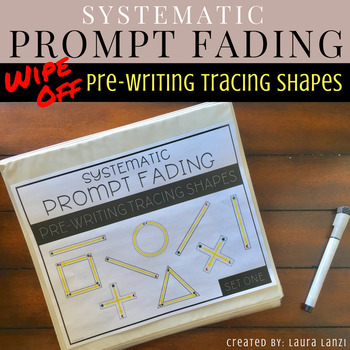 This writing program focuses on systematic prompt fading to help guide the student into functional yet easy beginning writing strokes with FOUR sets of these pre-writing shapes. Each set increases in difficulty and decreases in prompts for the student to become independently successful. Along with point cues, “To The Moon” is the verbal prompt you will use to help your students complete the tracing. 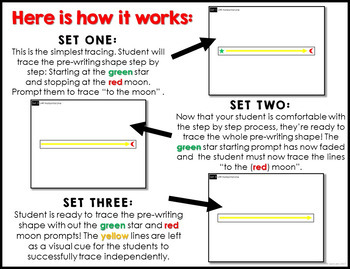 A green star cues student to start the tracing while a red moon cues student to stop tracing. Each set of tracings is organized for easy assembly. These work great in plastic sheet protectors in 3 ring binders or laminated for year long practice! Use them in individual work sessions or as a morning work activity. This program is perfect for an early childhood program or a special education classroom. 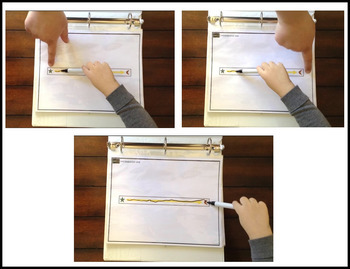 The Pre-Writing Tracing Shapes Program is a year-long tool that can be used in an autism program, special education classroom, home therapy or a preschool program. STILL NOT SURE IF THIS IS RIGHT FOR YOU? 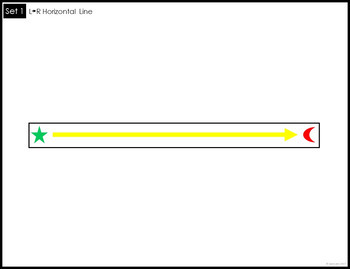 To access a free four page horizontal line trace simply download the preview now! >Lowercase Letter Trace Writing ProgramTake the next step in systematic prompt fading with this lowercase letter trace! Name Trace Precursor Writing Program -Teach your students how to write their name successfully! Color Tracing and Identification - Flipbook and matching packet teaching students how to read. write and identify colors.